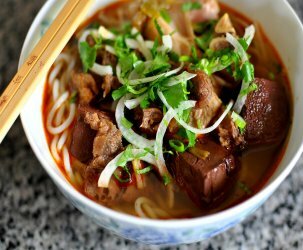 In spite of its billing, tangled heaps of slurp-worthy strands aren’t what it’s all about at 101 Noodle Express. A quick glance around the packed dining room makes it crystal clear that the beef rolls bring all the Northern Chinese bread food-seekers to the yard. 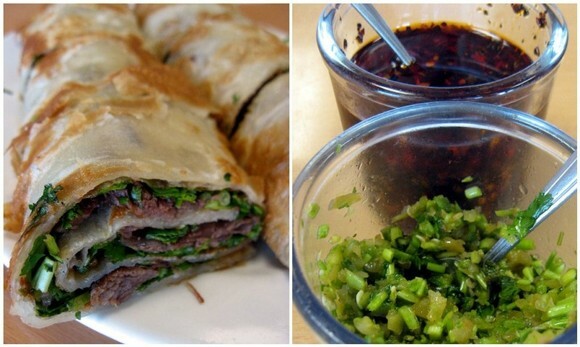 A Shandong classic, the hefty beef roll ($6.75) is comprised of a fried wheat pancake smeared with a hoisin-like bean paste and stuffed with fresh cilantro and thin cuts of beef. A single order includes two foot-long logs filled to the brim and sliced into manageable sections. The flaky pancake was warm to the touch and substantial enough to keep the fixins in line. Unadorned, the beef roll tasted like a carne asada burrito with a bready exterior and no trace of guac. My dining companion thought it tasted like a deconstructed bowl of pho. 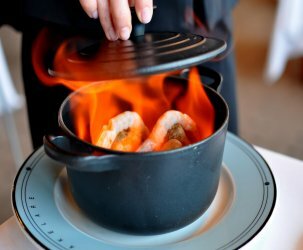 What really made the beef roll come alive were the two tableside condiments—a mixture of fresh chilies with cilantro and a chili infused oil. The container filled with the former was depleted by the time we were through. It’s about time this restaurant drops the “101 noodle” gibberish and re-christens itself Beef Rolls Express. Argh, you’re evil Cathy. I’m eating strawberries and non-fat yogurt and you’re blogging about my favorite Beef Roll in the area. I always get this to-go and sometimes this can last 2 meals. 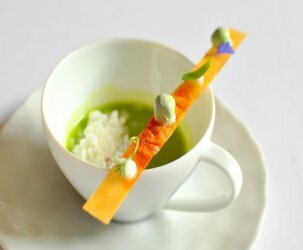 Great place, but I’m actually curious about the rest of the menu! Your writing is worthy of the Times’ food section, and by that I mean the New York Times. Excellent post. I have to hit this place up soon. Maybe lunch? Funny that the beef rolls are the specialty at a place with “noodle” in its name! Can’t say I’ve ever had this before! 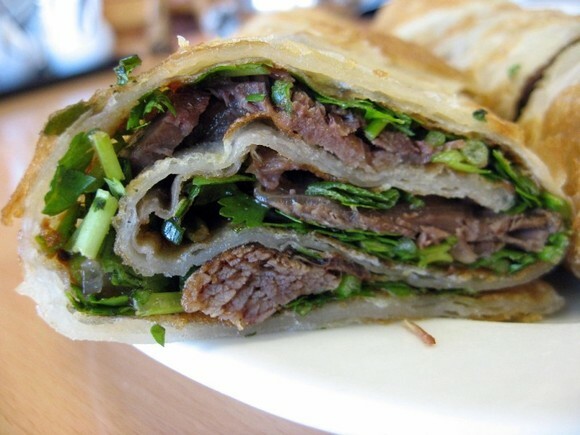 I do want to try making it with scallion pancakes! da-ham. “and their life is better than yours” for reals. this looks serious. me go there soon. But, enough about me. Great post as always! So excited to eat this on our marathon! I love me some cilantro! Oh that sounds fantastic! I must find someplace here that makes that fine sounding fauxphoroll. I love the Beef Roll there. It’s never failed me no matter how many times I’ve been there. Your next trip there, try the Shandong Chicken. It’s a cold chicken dish that’s so refreshing, especially in this heat. YUM! That looks like perfect fast food to me. Wow. If someone could guarantee that I would actually find one of those in Shandong I would make a trip. 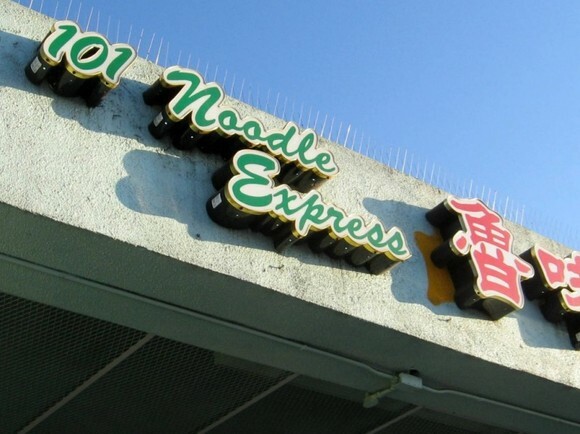 Pingback: 101 Noodle Express | O Hei There!